Emergency/SOS: Trigger an SOS from anywhere in the world with automatic GPS location tracking. Interact with 24-hour emergency monitoring center via two-way text messaging to describe the nature of your distress in detail and stay in touch throughout the rescue process. Send and receive text messaging: Send and receive160-character, free-form text messages to and from any cell phone number, email address, and other inReach users. View and respond to incoming messages directly on the screen. Convenient, quick messaging: Send simple, predefined text messages to email and cell phone contacts for anticipated situations. Follow-me/find-me tracking: Turn on and off tracking to share your GPS coordinates, course, speed and elevation in real-time with friends and family. Tracking intervals can be configured between 10 minutes and four hours. Delivery confirmation: Audible alerts, built-in LED light, and on-screen cues confirm communication with the satellite and indicate two-way message delivery. Social media posting: Send out a message or create a post via Facebook or Twitter. Transform your mobile device into a global satellite communication and navigation tool when you pair your inReach SE via Bluetooth with the Earthmate app (available free in the Apple Appstore and Google Play). Real-time GPS location, tracking and text messages are overlaid on the digital maps for easy navigation and position location from anywhere in the world. Unlimited downloadable topographic maps and NOAA charts on your paired mobile device when downloaded via an Internet connection. Unlike streaming maps on most cellphone apps, downloaded DeLorme maps remain cached in the Earthmate app even when you’re outside cellular coverage. Automatically syncs with your mobile device’s address book for easy message sending and allows you to view all your previous trips and messages. 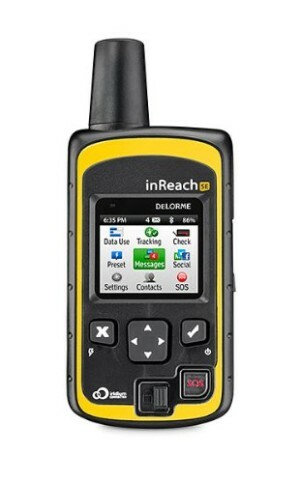 The inReach SE operates over the Iridium satellite network, providing truly global two-way satellite communications and high network reliability anywhere on Earth, with no gaps, fringe or weak signal areas. With the ability to maintain satellite signal lock even in difficult GPS environments, the inReach SE also offers global SOS capabilities, adjustable tracking intervals from 10 minutes to 4 hours, and remote real-time follow-me/find-me tracking and ping-me locating. In the event of an emergency, the interactive SOS capability of inReach automatically triggers remote tracking and allows users to describe and update their situation so proper resources can be deployed.